Today is National Voter Registration Day – are you registered to vote? Today is National Voter Registration Day – a perfect time to sign up if you haven’t already …..and make sure you can cast your ballot in the next election! 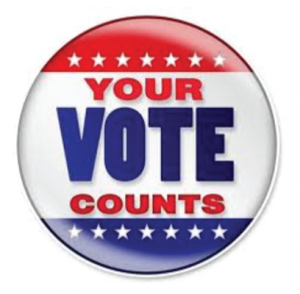 your voice matters…you choose who represents you and remember what your elected officials do affects our residents, our families and our communities….register to vote! This entry was posted in Uncategorized on September 25, 2018 by Kathy Gallin. 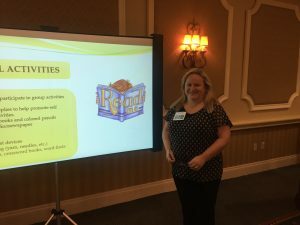 Back in February, Florida Health Care Activities Coordinators Association contacted me about the possibility of having one of our Directors speak at their 2018 conference and we knew it would be a perfect opportunity for our very own Sheri Morin to grab hold of this wonderful opportunity. On Monday, July 23rd at their 44th conference, Sheri presented on Integrating Quality of Life with Chronic Disease Management and the audience applauded her presentation! It is through great leadership that we share our initiatives with others on the great care we provide and with leaders like Sheri Morin we know we are advancing our mission and our vision to radically change the landscape of healthcare, forever! Kudos to our great partner, Sheri Morin, Quality of Life Director – Urban South. This entry was posted in Uncategorized on July 26, 2018 by Kathy Gallin. SHC stakeholders recently met with KY legislators at a breakfast in Monroe County. 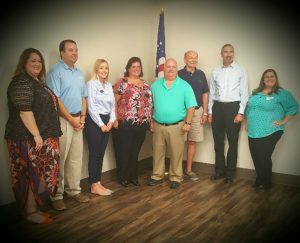 Senator David Givens, State Representative Bart Rowland, a rep for US Congressman James Comer and local Mayors gave updates on past year and bills in the system. Senator Givens promised he’d pay a visit to SHC Monroe County Rehab and Wellness Center soon! Attending the event on behalf of SHC were CEO/Administrator – Rita Crabtree, Leslie Smith – AIT and Ashley Hume…. This entry was posted in Uncategorized on July 25, 2018 by Kathy Gallin. Why do we celebrate the 4th of July – Independence Day in America today? In 1775 there were 13 colonies under the rule of England’s King George III. There was great unrest among the colonists around the taxes they had to pay to England – “Taxation without Representation” because the colonists had no say in the decisions of English Parliament….causing great unrest within the colonies. April 1775 — King George’s troops advance on Concord, Massachusetts, prompting Paul Revere’s midnight ride that sounded the alarm “The British are coming, the British are coming” which prompted the unofficial beginning of the American Revolution. May 1776 – Almost a year had passed and the colonies were still unable to work out differences with England. June 1776 –A committee was formed to draft the formal Declaration of Independence. June 28, 1776 –Thomas Jefferson presented the first draft of the declaration to the Continental Congress. King George did not want to negotiate with the colonies and sent extra troops to help control any rebellion that might be arising….but the British lost and on July 4th the colonies declared their independence from the British. July 4th, 1776 – The 13 colonies sent delegates to Philadelphia, to form the First Continental Congress and while there was trouble in the making, the colonies still had not yet declared war. King George did not want to negotiate with the colonies and sent extra troops to help control any rebellion that might be arising….but the British lost and the colonies declared their independence from the British. August 1776 – Although the signing of the Declaration began on July 4th, it was not actually completed until August, 1776. And so we celebrate our nations Independence and wish all a happy and safe 4th of July! This entry was posted in Uncategorized on July 3, 2018 by Kathy Gallin. As we look to this weekend as a very traveled and celebrated holiday, let us remember why we celebrate Memorial Day and what it is really about. Memorial Day is a federal holiday in the United States for remembering the people who died while serving in the country’s armed forces. It is observed every year on the last Monday of May, and it was originally called “Decoration Day” and began being celebrated after the American Civil War in 1868. 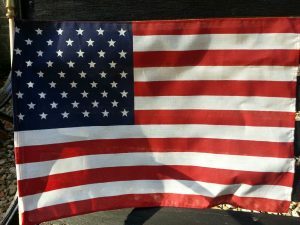 The name of the holiday was changed to Memorial Day around the time of World War I and then in 1968 Congress signed the Uniform Monday Holiday Act of 1968, which mandated that Memorial Day would be one of four holidays observed on a Monday (the other three are George Washington’s birthday, Labor Day and Columbus Day). This week, Congress passed the VA MISSION Act, which includes a provision to authorize VA Provider Agreements for long term and post-acute care providers, an initiative which has been the focus of our efforts for decades that will help remove some of existing red tape that may prevent providers from being able to provide care or offering the option to veterans who need both nursing center care and home and community-based services. It is expected that President Trump will sign it before Memorial Day. So while flags are placed on gravesites of those who gave their lives for our freedoms, children will frolic in parks, the smell of barbeque will be eminent….let us all take a moment to remember all of our Veterans across this country who sacrificed for our freedoms. We salute you, we honor you and we thank all Veterans for their service! This entry was posted in Uncategorized on May 25, 2018 by Kathy Gallin. 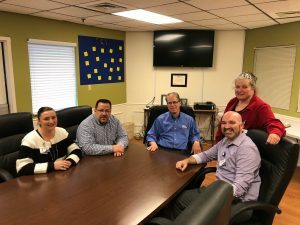 This week is National Skilled Nursing Care Week and how fitting to celebrate with a visit to Signature HealthCARE of Glasgow by Kentucky State Representative Steve Riley. 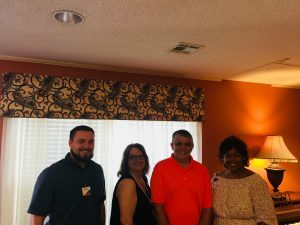 Representative Riley is no stranger to SHC-Glasgow and has visited with residents and stakeholders sharing his support of providers and engaging in conversation in his district about the importance of caring for Kentuckians. A former educator and coach, Rep. Riley stood strong during the recent legislative session in support of telehealth legislation which will enhance care across the Commonwealth. A big “thank you” to Representative Steve Riley for taking the time to stop by and visit with us and for supporting our issues and always listening to our concerns! This entry was posted in Uncategorized on May 15, 2018 by Kathy Gallin. Today is the National Day of Prayer, an event which we at Signature are observing company-wide. President John Adams declared May 9, 1798 as “a day of solemn humility, fasting, and prayer,” during which citizens of all faiths were asked to pray “that our country may be protected from all the dangers which threaten it“. On April 17, 1952, President Harry S. Truman signed a bill proclaiming a National Day of Prayer must be declared by each following president at an appropriate date of his choice. In 1982 the organization called the “National Prayer Committee” was formed to coordinate and implement a fixed annual day of prayer for the purpose of organizing evangelical prayer events with local, state, and federal government entities. In 1988, the law was amended so that the National Day of Prayer would be held on the first Thursday of May. Two stated intentions of the National Day of Prayer were that it would be a day when adherents of all great religions could unite in prayer and that it may one day bring renewed respect for God to all the peoples of the world. This entry was posted in Uncategorized on May 3, 2018 by Kathy Gallin. Spring City residents register to vote! Spring City Care and Rehab Center continues to raise the bar when it comes to ensuring that our residents are registered to vote. 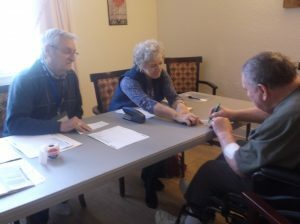 Aiming high to keep our elders and caregivers up to date on health policy and what is happening that may impact their lives, they recently had 12 residents register to vote in the upcoming 2018 elections. This entry was posted in Uncategorized on April 5, 2018 by Kathy Gallin. It is our mission and vision to change the landscape of healthcare, and one very key initiative to changing and innovating healthcare policy is meeting with legislators and legislative candidates, inviting them into our facilities and talking with them about the many challenges we face and also to showcase all of the positive things we do within our facilities. Such was the case recently when Signature HealthCARE of Muncie (a 5 Star facility) stakeholders, CEO-Administrator Keona Parkinson, DON Aaron Wells, transitional care nurse Wilma Carrier and Regional Vice President – Ben Wells sat down with US Senate candidate Mike Braun and had a great discussion related to health policy and the impact on Hoosiers! This entry was posted in Uncategorized on March 29, 2018 by Kathy Gallin.